Some white dwarfs though challenge scientists, as they show evidence for highly ionised metals. In astronomy 'metals' describe every element heavier than helium, and high ionisation here means that all but one of the outer electrons usually in their atoms have been stripped away. That process needs a temperature of 1 million degrees Celsius, so far higher than the surface of even the hottest white dwarf stars. Reindl's team used the 3.5-metre Calar Alto telescope in Spain to discover and observe a white dwarf in the direction of the constellation of Triangulum, catalogued as GALEXJ014636.8+323615, located 1200 light years from the Sun. Analysing the light from the white dwarf with a technique known as spectroscopy, where the light is dispersed into its constituent colours, revealed the signatures of highly ionised metals. Intriguingly these varied over a period of six hours – the same time it takes for the white dwarf to rotate. 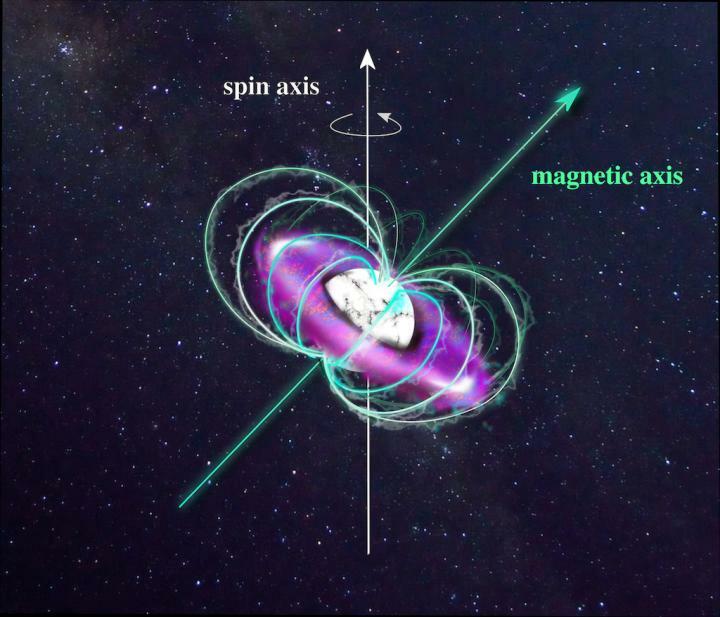 Reindl and her team conclude that the magnetic field around the star – the magnetosphere – traps material flowing from its surface. Shocks within the magnetosphere heat the material dramatically, stripping almost all the electrons from the metal atoms. "It's like a doughnut made up of ultra-hot material that surrounds the already very hot star" explains Reindl. "The axis of the magnetic field of the white dwarf is tilted from its rotational axis. This means that the amount of shock-heated material we see varies as the star rotates. 'After decades of finding more and more of these obscure stars without having a clue where these highly ionised metals come from", she continues, "our shock-heated magnetosphere model finally explains their origin." Magnetospheres are found around other types of stars, but this is the first report of one around a white dwarf. The discovery might have far-reaching consequences. "We simply didn't take this into account", admits Reindl. "Ignoring their magnetospheres could mean measurements of other basic properties of white dwarfs are wrong, like their temperatures and masses." Artist's impression of the hot white dwarf GALEXJ014636.8+323615 (white) and its ultra-hot circumstellar magnetosphere (purple) trapped with the magnetic field (green). Credit: N. Reindl. The Royal Astronomical Society (RAS, http://www.ras.ac.uk), founded in 1820, encourages and promotes the study of astronomy, solar-system science, geophysics and closely related branches of science. The RAS organizes scientific meetings, publishes international research and review journals, recognizes outstanding achievements by the award of medals and prizes, maintains an extensive library, supports education through grants and outreach activities and represents UK astronomy nationally and internationally. Its more than 4,000 members (Fellows), a third based overseas, include scientific researchers in universities, observatories and laboratories as well as historians of astronomy and others.